all. in. the. details. - bitte.und.danke. Last day of February? Time flies when you’ve got a growing to-do list looming over you. With spring on the horizon (only 20 days away — put it in your iCal!) I'm slowly, but surely starting to work in spring wardrobe essentials. (Knowing how spring in Virginia goes though, I have a feeling we haven’t seen the last of winter yet. I like to call it sprin-ter.) And that’s where today’s #OOTD comes in. 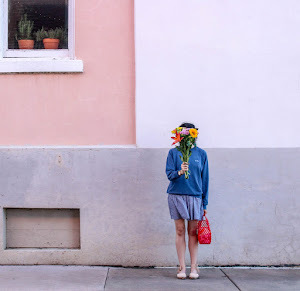 What better way to make the transition from winter to spring than with a lightweight Madewell knit sweater (I’m obsessed with the pinkish coral hue! ), skinny jeans (cuffed ‘cuz I'm borderline petite) and lace-up ballerinas? Give or take a little peekaboo tulle trim. I know this outfit isn’t particularly fancy, but goodness knows I'm a sucker for a dialed down look that works overtime on the weekend. Since I know that tulle’s having a bit of a moment, I paired my oversized sweater with a frilly hem tank top that I’ve had for years. The result was a little bit girly, a lot femme — and definitely sophisticated. For accessories, I opted for a simple gold horn necklace and an Old Navy bucket bag that never fails to fit the bill. Last but certainly not least, let’s take a sec to chat about these olive suede flats (also from Madewell). They’re. Literally. Perfection. I got them on sale on a whim, but never imagined how comfortable/amazing/foolproof they’d be. Not only was I able to break them in during the first wear, but they’re extremely versatile with jeans, denim button-front skirts — you name it. Sometimes the ties have a way of unraveling over the course of the day, but otherwise, they’re < insert praise hands emoji here >. Okay I lied, one more thing. Can we all just agree that a good hair day shall *always* be documented? Lately, I’ve been all about peppy ponytails. They’re fun, girly and immensely underrated. Throw in a bow hair tie and I'm pretty much on cloud nine. Sue me for my obsession with bows — they may not be for everyone, but you can definitely count me in. 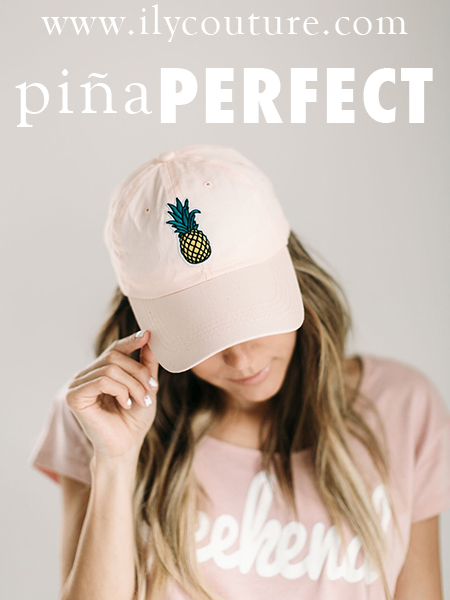 What are your spring style essentials? Comment below! This outfit is so darling! Love your bucket bag! Thank you, Rachel! It's definitely my favorite bucket bag — I just can't believe it's from Old Navy! 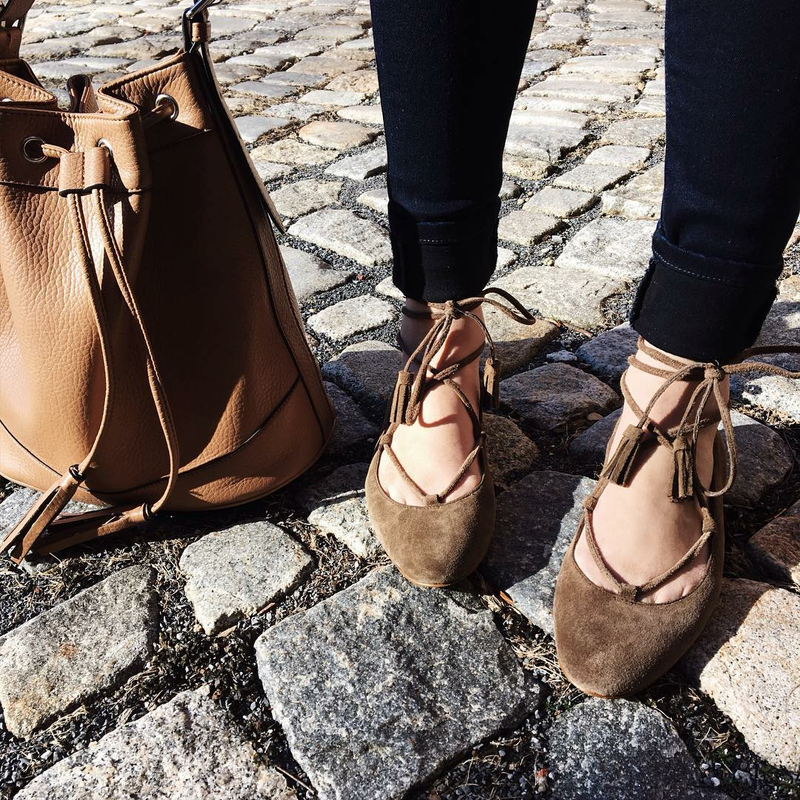 I'm currently loving lace-up flats too! How cute is that knit! TY! I just love how effortless + easy to style it is! Oh I love that sweater! You look perfectly girly and chic! Love everything about this outfit! Omg I love the knit sweater and the flats – so adorable! So cute! I love the little ruffle hem! Thank you! That's my favorite detail too!